Brazil Fast Food Corp. is a rapidly-growing fast food franchiser in one of the world’s most promising emerging markets, Brazil. From 2002 to 2012, the company grew revenues at an average annual pace of 15.6% and grew its operating margins from -3% in 2002 to a record 12.2% over the four trailing quarters. The company also transformed its balance sheet along the way, achieving a net working capital surplus and reducing leverage to the lowest point in the last decade. Despite its outstanding record of growth and value creation (a 40% annualized return for investors since 2003, excluding irregular dividends) the company trades at only 8 times earnings and an EV/EBITDA multiple of 4.4. Brazil is one of the world’s largest democracies, with a population of nearly 195 million. For many decades, Brazil’s story mirrored many other South American countries, complete with military coups, rampant corruption and runaway inflation. The worst of this period ended in 1985 with the first free elections since the 1960s. But transitioning to a democratic system did not bring a resolution to Brazil’s economic woes, and the country was plagued by inflation until the execution of the “Plano Real” in 1994. The plan instituted a new currency and gradually succeeded in bringing inflation down to First World levels in the single digits. Not to say there weren’t hiccups along the way, but the plan was a rousing success on the whole. Over the next two decades, the resulting stabilization helped foster a great increase in Brazil’s wealth and ranks of its middle class. Brazil’s growth rate has slowed in response to challenging world economic conditions and weakness in commodities prices, but the country’s young demographics and increasing per capita income still make it a promising market for investment. Brazil’s economic history and the genius of the “Plano Real” are topics worth studying in their own right. NPR’s Planet Money has an intriguing broadcast on the plan that can be found here. As of March 31, Brazil Fast Foods owns or franchises a whopping 1,049 restaurants in Brazil, Chile and Angola. (The Chilean and Angolan restaurants account for only twelve of these units and their value is immaterial, per the company.) Of these 1,049 points of sale, roughly 42% are kiosks or express concepts offering a limited menu. These units are located inside convenience stores or similar locations. The other 58% of the company’s restaurants are traditional units. Franchisees operate 972 of the company’s restaurants, while the company operates 77 locations. For several years, the company has been making efforts to reduce the number of company-operated restaurants and increase its ranks of franchisees. Brazil Fast Foods manages five different brands, some of which are Brazilian brands and others are well-known American restaurant concepts. 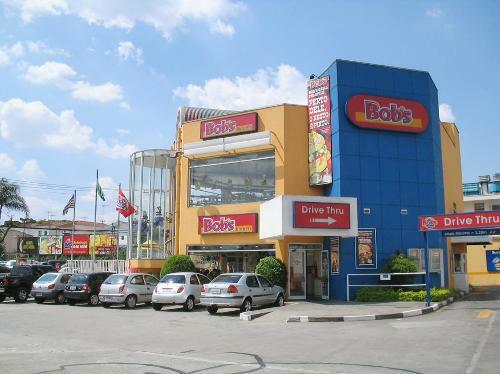 Brazil Fast Food’s main line of business is Bob’s. The company operates 39 locations and an additional 922 are operated by franchisees. Bob’s serves a classic fast food lineup centered on hamburgers and milkshakes. Bob’s was founded in the 1950s by an American-Brazilian tennis player named Robert Falkenburg as the first Brazilian fast food chain. A typical Bob’s looks much any ordinary American fast food establishment. Bob’s franchisees pay Brazil Fast Foods 4% of monthly gross receipts. In 2007 and 2008, Brazil Fast Foods expanded its operations by opening KFC and Pizza Hut franchises. The company operates 14 KFC restaurants in Rio de Janeiro and 22 Pizza Hut units in Sao Paulo. Revenues from these American brands are growing rapidly and making up more and more of Brazil Fast Foods’ turnover. 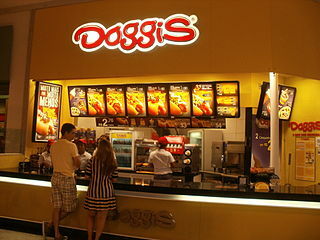 In 2008, Brazil Fast Foods obtained the right to operate the Doggis brand in Rio de Janeiro from a Chilean company. As the picture suggests, Doggis is a fairly traditional hot dog restaurant. The company once operated these restaurants itself, but has since converted all 11 of the units into franchised restaurants. Finally, Brazil Fast Foods owns Yoggi, a frozen yogurt concept. The company acquired Yoggi in May, 2012, and has 39 franchisees. Brazil Fast Foods notes that all of its Brazilian restaurants are located in Southeastern Brazil, the country’s richest and most populated region. Trailing twelve months and five fiscal year results are presented below, converted into USD at today’s exchange rate of $0.493 USD per Brazilian Real. Operating income is more indicative of profitability, as net income figures include the effects of selling off company-owned restaurants. Despite a rocky world economy, Brazil Fast Foods has thrived. While revenue growth has been impressive, the company has compounded the effect by converting an ever higher proportion of revenues into operating income. Part of this success is due to the company’s franchising efforts. Franchising is a high-margin business that requires little marginal investment. The company’s main expenses in its franchising business are advertising campaigns, quality assurance and supply chain management for its franchisees. By contrast, the company-operated restaurant segment must pay for service employee salaries, food costs, occupancy costs and many more costs that the franchising business escapes. The company provides very helpful financial comparisons between its franchising and company-operated restaurant segments. Again, I have converted all figures to USD at the current exchange rate. Though revenues from its company-operated stores make up 79% of total revenues, franchising operations contribute 62% of total operating income. Its easy to see why the company is eager to grow its franchising arm. At the same, the company-operated segment is putting up better numbers than ever. Operating profit is over seven times what it was only five years ago, largely on great results at the company’s KFC and Pizza Hut restaurants. The long-term revenue decline at the company’s flagship Bob’s locations may seem troubling, but the decline is due to a gradual reduction the number of company-operated Bob’s restaurants. On a same-store basis, revenues actually increased 27.3% from 2007 to 2012. Brazil Fast Food’s consistent profits have allowed the company to repair its balance sheet, which was in sad shape a decade ago. As successful as the 2000s were for the company, the 1990s were the polar opposite. At that time, the company’s sole line of business was operating Bob’s restaurants. The company’s franchising business was in its infancy. In 1997, for example, the company had only 56 contracted to franchisees, compared to over 900 now. Operating costs were out of control and the company was repeatedly forced to offer shares and obtain additional capital. Despite its troubles, the company finally hit on a good business plan and has been thriving since. Book value per share in USD has grown from -$0.33 in 2003 to $4.41 at March 31, 2013. Brazil Fast Food’s cash on hand is over twice its debt. Most of the company-operated restaurants are subject to leases with terms of up to five years, and these lease obligations do not appear on the balance sheet. These could present a risk if sales were to decline significantly. However, the company’s operating margin on these restaurants is healthy, which reduces the risk of these lease payments becoming an issue. At year end, these lease obligations total $22.9 million. Brazil Fast Food’s last trade price was $11.60 for a market capitalization of $94.3 million. Trailing P?E is 8.0, though this includes one-time gains from converting company-operated units into franchised restaurants. 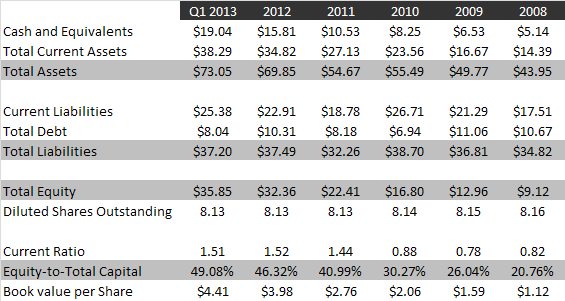 The more useful EV/EBITDA metric stands at 4.4. It’s tough to find a direct competitor for comparison purposes, but Arcos Dorados’ business model is similar enough to facilitate a comparison. Arcos Dorados is the largest franchiser of McDonald’s restaurant in South America and Latin America, and has a substantial presence in Brazil. Brazil Fast Foods and Arcos Dorados have similar opportunities in emerging markets and operate similar restaurants, but their valuations could hardly be more different. While Brazil Fast Foods trades at 8x earnings, Arcos Dorados trades at 28x. Arcos Dorados’ EV/EBITDA is 10.2, more than twice Brazil Fast Foods’ valuation. 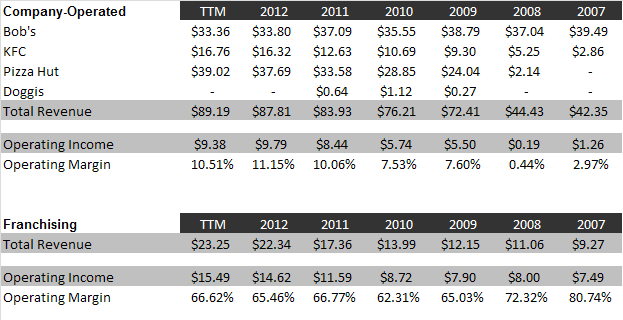 10.2x EBITDA for a high-growth emerging markets company may or may not be a good value, but 4.4x very likely is. If Brazil Fast Foods Corp. traded up to 7.1x EBITDA, just 70% of Arcos Dorados’ valuation, shares would rise to $17.93, a gain of 55%. Like any other emerging markets country, Brazil Fast Foods faces special political risks. Brazil has enjoyed a multi-decade period of stability, but that doesn’t mean the country is out of the woods entirely. Problems of corruption, income inequality and inflation remain. On the other hand, the country’s recent oil discoveries and significant foreign currency reserves will provide surer economic footing. Brazil’s dollar-denominated debt rating was raised to BBB by Standard & Poor’s in 2012. Part of Brazil’s legacy of instability is a frequently-changing and often arbitrary tax system. Brazil Fast Foods has a long-term disagreement with the Brazilian government over taxes owed by the company’s Venbo subsidiary. Though the company disputes these tax assessments, claiming they were calculated incorrectly, the company lists a potential liability for the disputed amount of $3.2 million on its balance sheet. The company is also embroiled in a dispute over taxes on the royalty payments it receives from franchisees. The company believes these payments are not subject to the municipal tax on services received, but the city of Rio de Janeiro believes otherwise. The matter is in court, but the company lists a possible liability of $4.3 million. Investors in Brazil Fast Foods Corp. must be comfortable buying into an insider-controlled company. Mr. Rômulo B. Fonseca and Mr. José Ricardo B. Bomeny together own 57.7% of shares outstanding, and other insiders own an additional 3%. In 2010, the company executed an agreement to sell all eight of its owned real estate properties to these investors. The company states these sales were done at fair market value and the company realized a gain on the sales. 64 of the company’s restaurants are franchised to Mr. Fonseca and Mr. Bomeny. These units pay the same royalties as all other franchisees. No other related-party transactions were disclosed in the 2012 annual report. Brazil Fast Foods represents an opportunity to invest in a fast-growing company that operates in an attractive industry and economy. Upcoming events like the 2014 World Cup in Brazil and the 2016 Olympics in Rio de Janeiro will put Brazil in the spotlight and could drive sales. Until then, continued improvement in operating margins and growth at the company’s operated restaurants and franchisee roster could further increase revenues and profits, making Brazil Fast Foods’ valuation look better and better. I have a position in Brazil Fast Foods Corp.
Steinway Capital (his user ID) on Seeking Alpha had some interesting thoughts on this company. You should check his comments out. As usual, Steinway is rambling but highly knowledgeable (and entertaining). Thanks for the interesting idea—I am a big fan of franchisors (particularly those rare gems that trade at ~4x LTM EBITDA). One quick question—if I compare Q4 2012 to Q1 2013, I see a fairly considerable drop in EBIT (R$12.2mm in Q4 vs. R$7.2mm in Q1). Any color here? BOBS’ business experiences seasonality. Q1 and Q2 have historically been the weakest as the colder weather keeps customers indoors. Q3 and Q4 are better as summer rolls around. I think a better comparison is same quarter results year over year. Q1 2013 EBIT was up 29.1% over Q1 2012. Don’t you have to convert each year using that years exchange rate, not todays exchange rate? With higher inflation in Brazil, growth will be distorted if you use todays exchange rate for previous years. You can make a case for converting at the prevailing exchange rate at the time, but it would have obscured what I was trying to present–that BOBS is growing quickly in its home markets. For example, 15% growth in BRL while BRL depreciated 15% against USD would make it look like the company was not growing at all, when it was actually increasing units, revenue and profits. My thought is except in cases of clear runaway inflation, currencies will rise and fall and I care more about if a company grows in real terms in its local currency. Brazilian inflation averaged about 6% over the last decade, so BOBS managed 9% real annual growth in revenues. For what its worth, revenue growth was even higher in USD terms over the last decade because BRL appreciated against USD. Fantastic write up and it is always nice to see other value bloggers, especially ones I respect like yourself, agree with an analysis I made. Thanks! Looks like we reached many of the same conclusions. Nice write up yourself. I’d love to hear your thoughts if you get a minute. Thanks again for the idea! Thanks for your thoughts! I’ll email you once I have reviewed your analysis. What do you think of the buyout offer? I think it is a low-ball attempt from management to steal the company on the cheap. I’m very upset with this. Are any shareholders attempting to dissent in an organized fashion? That is precisely what the offer is. I believe Jason Rivera at http://valueinvestingjourney.com/ has been attempting to contact BOBS shareholders. I’d shoot him an email. What are your thoughts now? Good news that the deal was voted down, right? While I view this as good news, what are your thoughts going forward? My worry is that there may be a chance for “revenge” and management may extract its revenge by not treating minority holders as fairly in the future. Thoughts? Definitely a plus that the deal was voted down. I don’t think management will come back with another sorry offer like that again. On the other hand, companies with control owners hostile to minority shareholders definitely deserve a discounted valuation, based on the possibility that the control owner will force a buyout at less than fair value. If BOBS would be worth 16-20x earnings without that risk, perhaps its worth 14-17x when that risk is considered. Do you still own this? Looks like there’s another buyout offer on the table…$18.30 this time. Actually, I never did buy any shares. I think this offer has a much better chance of succeeding. And from the buyer’s perspective, the deal is a lot higher than the last offer because of how poorly the Brazilian Real has done since.